Sp. Pl. 3 (1800) 655. Small, sparsely branched, succulent subshrub, 0.2-0.4 m high when in flower. Stems smooth, almost glossy, with persistent stipules, dark purple-brown to black, 8-12 mm in diameter, <120 mm long. 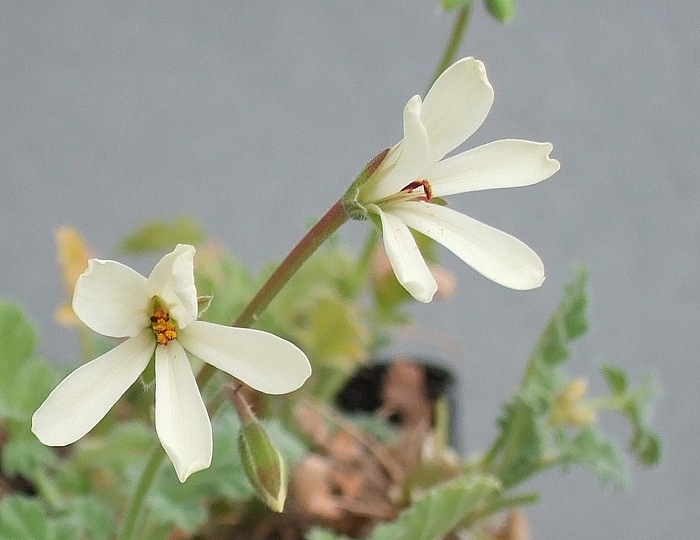 Leaves simple, membraneous, with sparse microscopic hairs, densely covered with short glandular hairs, light green. Lamina cordate in outline, pinnatifid to pinnatilobed, base cordially incised, apex rounded, margin crenate, 20-50(-70) x 20-45 mm, petiole (15-)25-90(-130) mm long. Stipules narrowly triangular to ovate with acute apices, 3-13 x 2-11 mm, membraneous, persistent, ivory white when dry. 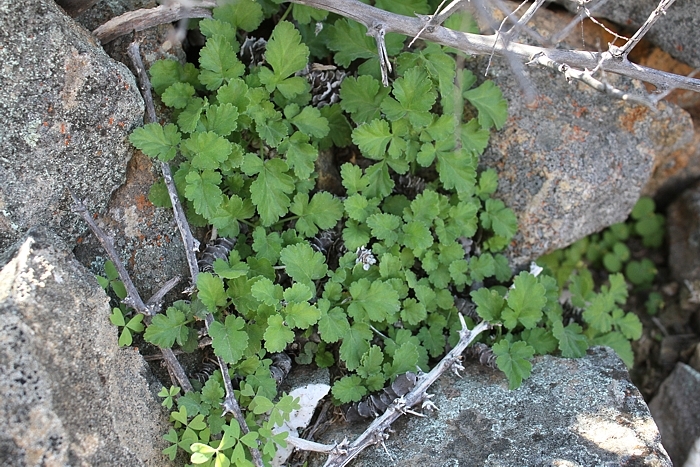 Branch ramified, with smaller foliar leaves, bearing several 2-5-flowered pseudo-umbels. Peduncles 45-110 mm long. Pedicel ~1 mm. 5, narrowly ovate with acute apices 6-11 x 2-2.5 mm. Hypanthium 40-60 mm. Petals 5, light yellow or occasionally pure white. Posterior two spathulate, 21-22 x 6-7 mm, reflexed at ~45o from the middle, without markings, though sometimes tinted pink at bases. Anterior three cuneate, 17-20 x 5-6 mm, gradually recurved over the entire length, with two dark pink fused lines near base. 7 fertile, 2 long, 3 shorter, 2 short. Pollen orange. 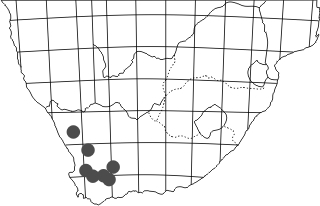 P. stipulaceum is frequent from Kamieskroon in the north-west to Matjiesfontein in the south-east, at altitudes 350-1350 m, often braving temperatures below freezing. 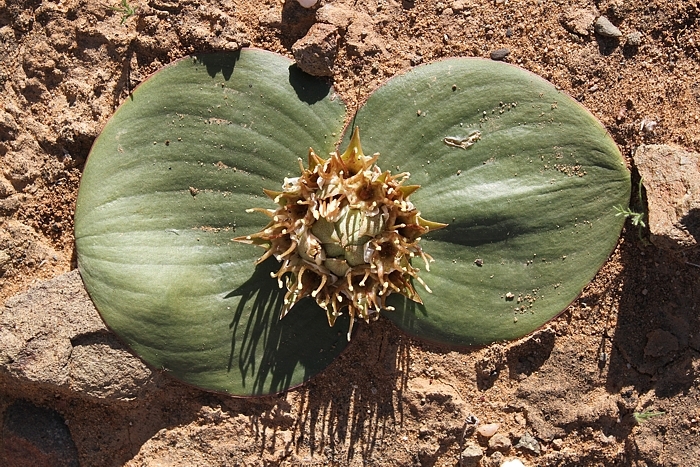 The top photograph is from 5 km N of Matjiesfontein, where it is joined by P. moniliforme (for further habitat photos please see there) and a number of succulent and bulbous plants, including the above Massonia depressa, or hedgehog lilly, with flowers smelling of yeast and pollinated by rodents. 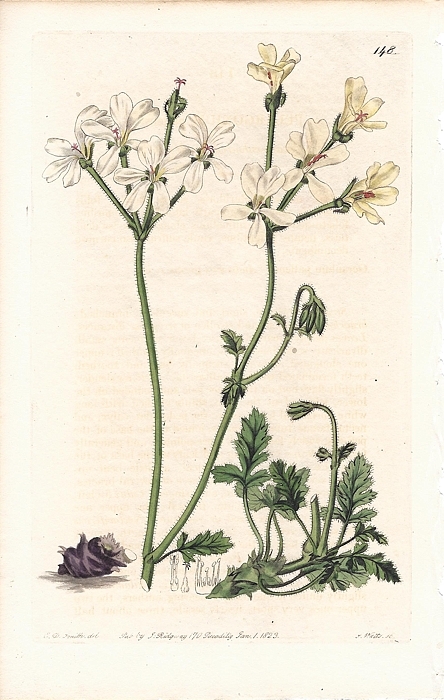 R. Sweet, Geraniaceae: The Natural Order of Gerania, 1823, Tab. 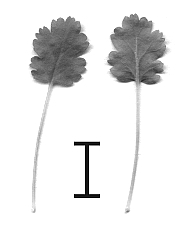 148 (as Pelargonium pallens).